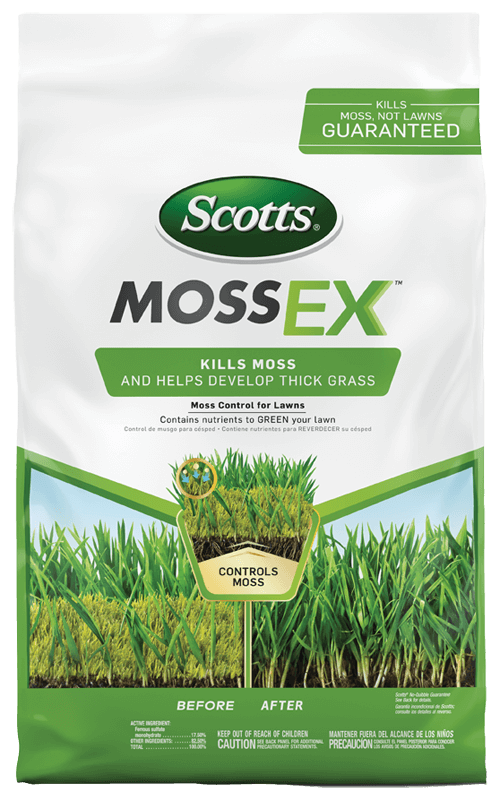 Kill moss, not your lawn, with Scotts® MossEX™. Scotts® MossEX™ provides nutrients for your grass to prevent future moss problems. Apply easily with a Scotts® spreader during winter or spring when moss is actively growing. Check bag for spreader setting. When using a Scotts® broadcast or Wizz® spreader, make a perimeter pass of your lawn with EdgeGuard® on to protect non-lawn areas. Then, make parallel internal passes 5 ft. apart to ensure even coverage. When using a Scotts® drop spreader, start 5 feet from the edge of your lawn and walk the outline of your lawn. Then, make internal passes across your lawn, overlapping the wheel marks to ensure uniform coverage. Help keep our water clean. Do not apply near water, storm drains, or drainage ditches. Do not apply if heavy rain is expected. Apply this product only to your lawn, and sweep any product that lands on the driveway, sidewalk, or street back onto your lawn. Brush particles from cement, stone, clothing, or shoes to prevent staining. Apply when lawn is moist and tall grass has been mowed to expose low-growing moss. Apply during winter or spring when moss is actively growing. Wait 2 to 4 weeks between applications. For normal moss infestations, apply with a Scotts® broadcast spreader set to 2-1/4, a drop spreader set to 4, or hand-held or WIZZ® spreader set to 3-1/4. For heavy moss infestations, apply with a Scotts® broadcast spreader set to 2-3/4, a drop spreader set to 4-1/2, or hand-held or WIZZ® spreader set to 3-3/4. Help keep our water resources clean. Apply this product only to your lawn, and sweep any product that lands in the driveway, sidewalk, or street back onto your lawn. Scotts No-Quibble Guarantee®: If for any reason you, the consumer, are not satisfied after using this product, you are entitled to get your money back. Simply send us evidence of purchase and we will mail you a refund check promptly. For more details, click here. If empty, place bag in trash or offer for recycling if available. If bag is partly filled, call your local solid waste agency for disposal instructions. Never place unused product down any indoor or outdoor drain. People and pets can re-enter the lawn once dry. Grass blades may turn black temporarily, however this condition will disappear after mowing. Kills moss and helps develop thick grass. Contains added nutrients to strengthen and green your lawn. Kills moss, not lawns. Fast Acting. Apply with a garden hose. Doesn't stain concrete.